If you're looking for one simple ingredient to transform your grilled meats, this is one of my favorites. was several years ago at Chef Mateo Granados' wildly popular booth at the Healdsburg Farmer's Market. He's known throughout the area for his inventive catering and "pop-up dinners" and has since opened Mateo's in Healdsburg which is definitely worth a visit. His taco recipe is still my favorite - something about the lemon juice and marinating overnight that makes the meat - it's just as good with beef or pork, super juicy and fork tender. 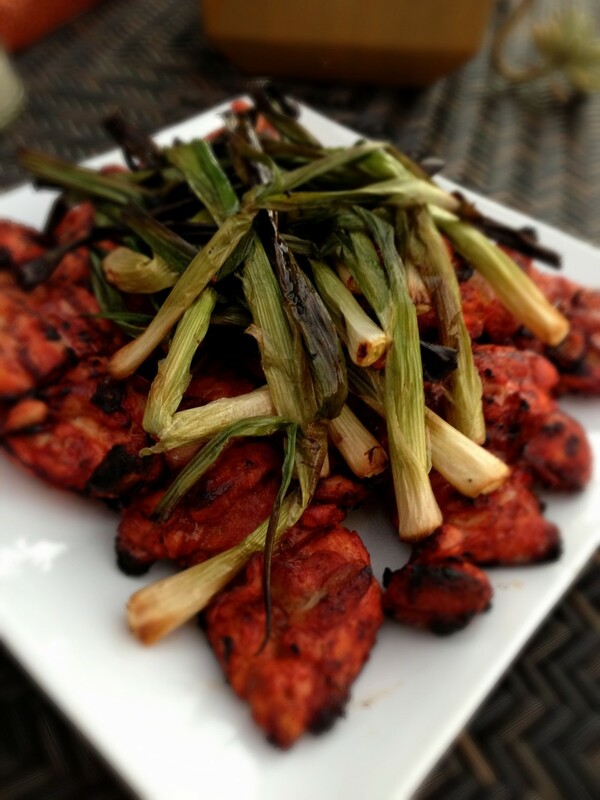 Pickled red onions are a great condiment but I also like to add grilled scallions. This recipe provides enough marinade for a whole chicken cut into serving pieces, although Granados prefers to use leg-thigh quarters. He removes the thigh bone before marinating, an optional step. Grilling the chicken slowly over indirect heat produces a crusty skin and juicy interior. Instructions: Put the chicken parts in a non-reactive container, such as a glass baking dish. In a small bowl, combine the achiote paste, lemon juice and salt and use your fingers to blend the mixture until it is smooth. Strain the mixture through a fine sieve over the chicken, then turn the chicken in the marinade to coat all sides. Cover and refrigerate for 24 hours, turning it in the marinade halfway through. Prepare a medium-hot charcoal fire or preheat a gas grill to medium-high. Create an area for indirect grilling: if cooking with charcoal, bank the coals under one-half of the grill rack or make a ring of coals with a bare space in the center; with a gas grill, leave one burner unlit. Remove the chicken from the marinade to a platter. Drizzle with the olive oil and rub the oil evenly over the chicken parts with your hands. Place the chicken on the grill, skin side down, over indirect heat. Cover the grill, leaving vents open. Cook, turning once, until the chicken is appetizingly browned on both sides and no longer pink at the bone, 25 to 30 minutes. Let the chicken rest 10 minutes before serving. To serve, wrap some grilled chicken in a tortilla with any or all of the accompaniments. Note: Achiote paste is available at Mexican markets.